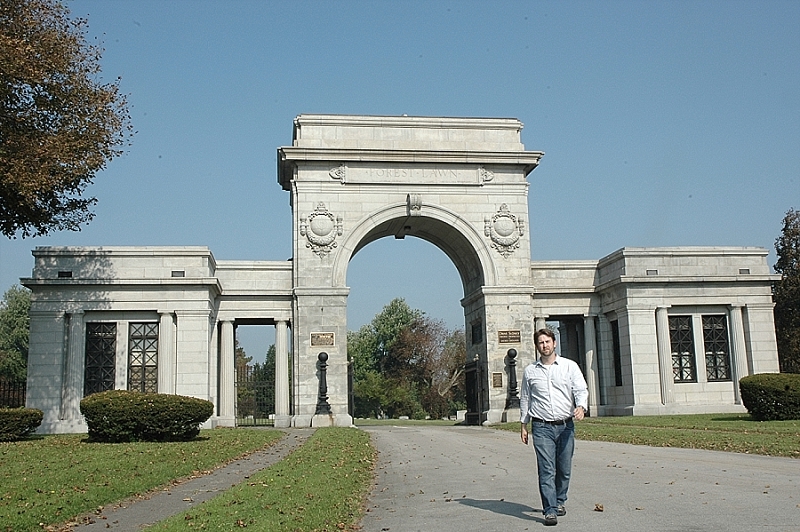 September 27, 2017 — There are a lot of reasons to visit Buffalo’s Forest Lawn Cemetery. 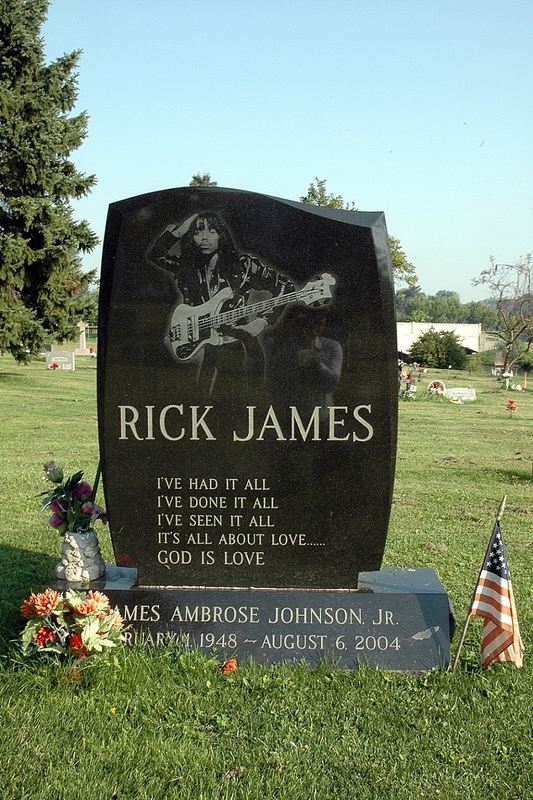 Maybe you’re into music, so you want to see the grave of Rick James. 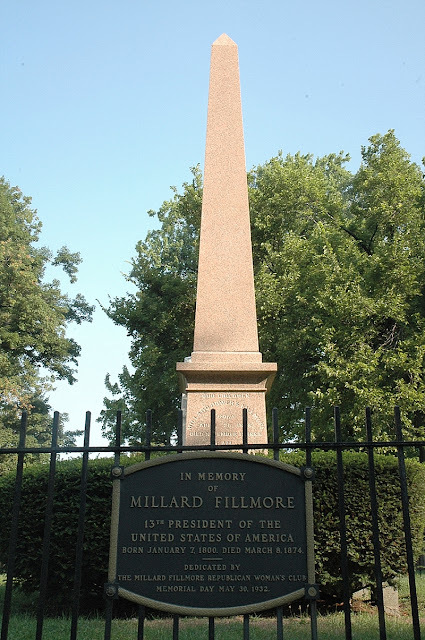 Maybe you’re into American history, so you want to see the grave of President Millard Fillmore. Architecture? 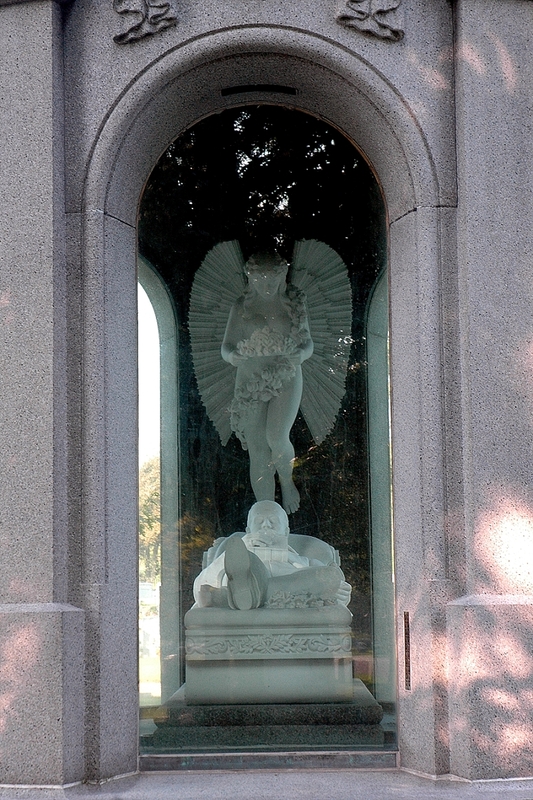 How about the only mausoleum designed by Frank Lloyd Wright. 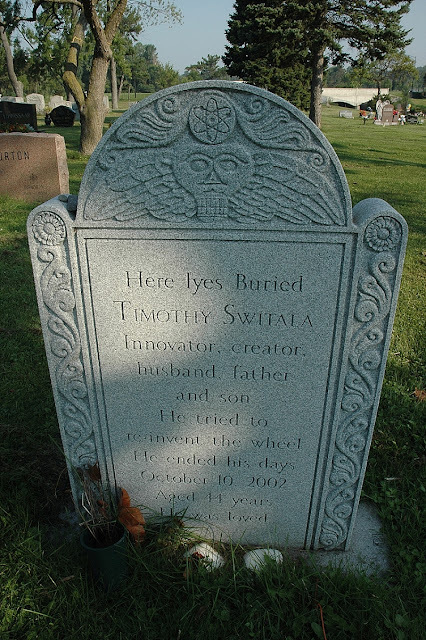 Maybe you’re just a weirdo [surreptitiously raises hand], so you want to see the grave of the dentist who invented the electric chair. Maybe you just want to roam the cemetery’s 269 acres of graves and art installations, taking in the history of this cemetery that has been planting the dead since 1849. Like I said, lotsa reasons. 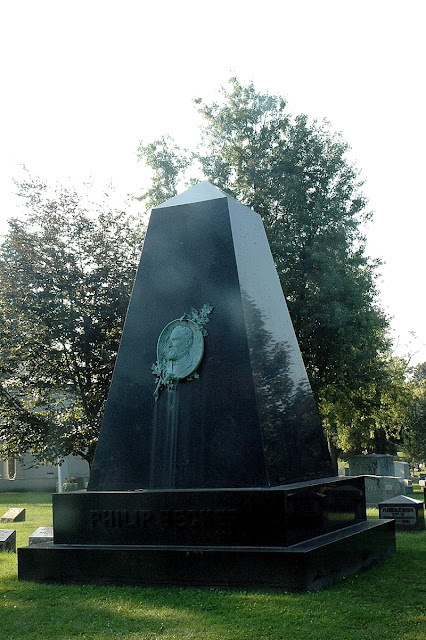 But I got one better than all those: The Blocher Memorial. The Blocher Mausoleum looks kind of like a giant snow-globe, sans snow, and, you know, a mausoleum instead. 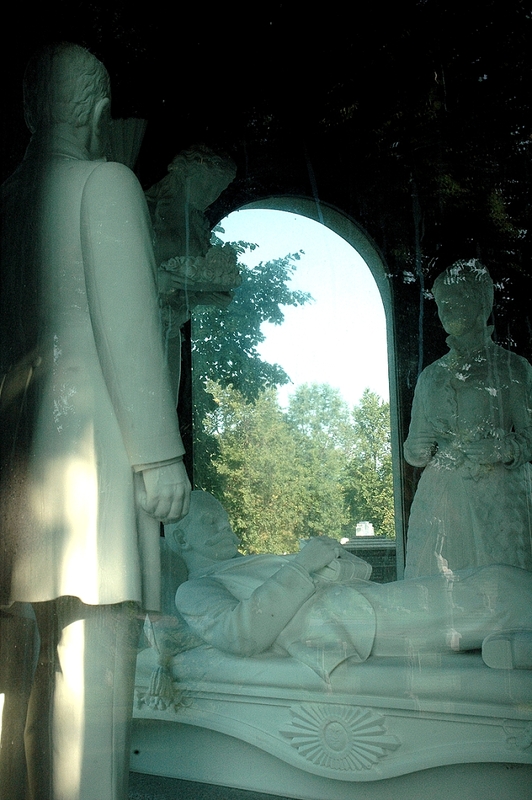 It crystallizes the dying moments of Nelson Blocher, who reclines on a couch in a suit and spiffy shoes, while his parents and an angel watch over him. The whole sorrowful tableau is carved from Italian marble. 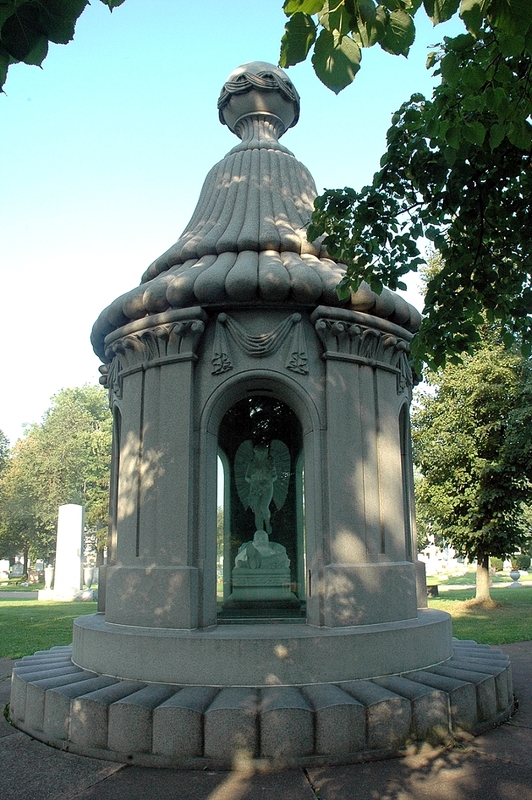 Nelson’s father John Blocher made his fortune in real estate and footwear (hence the spiffy shoes for his sons statue), but in 1884 when his 37-year-old bachelor son died after a lingering illness, John put his money and his efforts into a monument that would memorialize that son and hold his family ’til the Last Trump. It cost about $100,000 dollars (about $3 million in today’s creds), and created a permanent death bed scene in a space where death beds are usually six feet deep. John’s wife Elizabeth died in 1904 at age 76, and John himself met the marble angel in 1911 at the age of 86. All three lie beneath the floor of that bell-shaped granite and glass-topped scene. It’s even surrounded by stone couches so that you can have a seat and fathom the unfathomable. 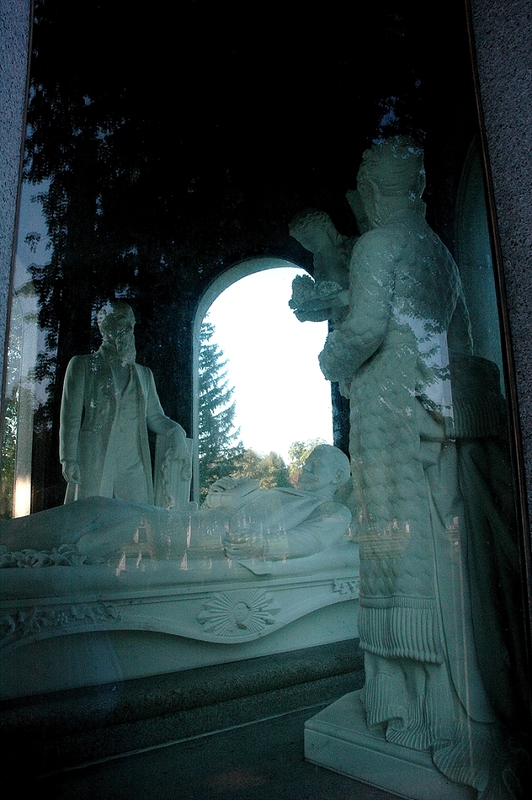 As impressive as the mausoleum is, it’s not the largest or most expensive mausoleum in Forest Lawn. That would be the Letchworth-Skinner mausoleum, with is a three-story, sandstone temple full of Italian and Egyptian marble. But the Blocher Museum really just makes an impervious case for being the focus point of the entire cemetery. 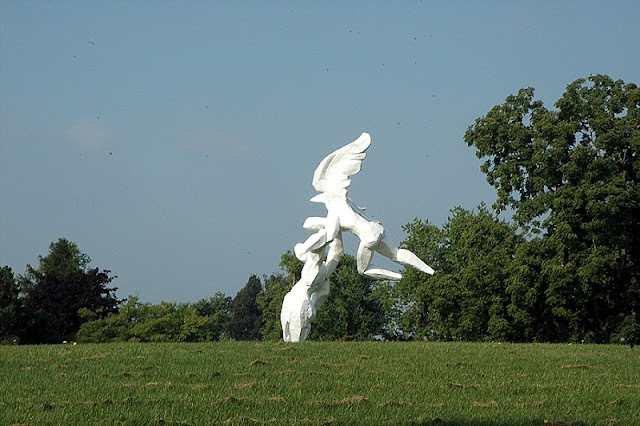 In fact, it stands out so much that it has of course accreted lore. We can’t not assign stories to the strange. The apocryphal story here is that Nelson actually died of a broken heart when his father fired the family’s Irish maid Katherine, with whom he was in love. It’s pretty weak as far as stories go. Especially when the true story is much more compelling: A couple’s only son dies, inspiring them to create an unconventional monument to that moment. 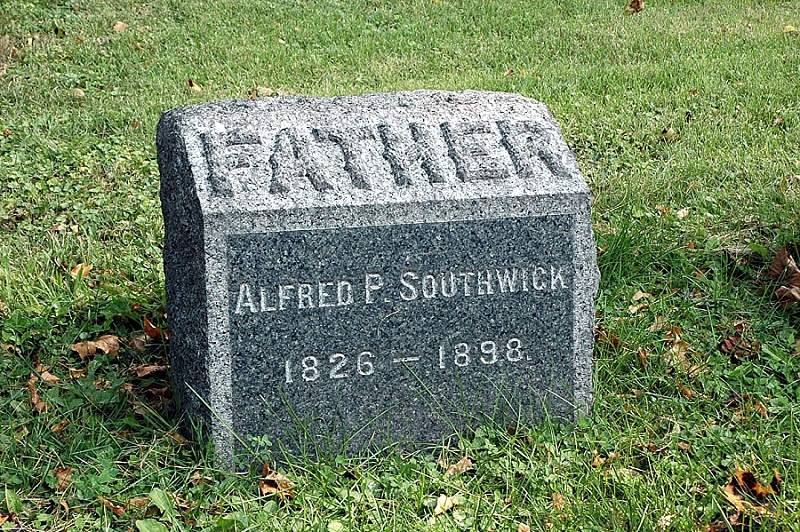 Not to the son himself, mind you. For they could have erected an upright statue of the man in his prime. Instead, they carved his death scene. So it must have been a uniquely powerful moment for them. One that you can check out for yourself. Right after Rick James’s grave. The dentist who invented the electric chair.